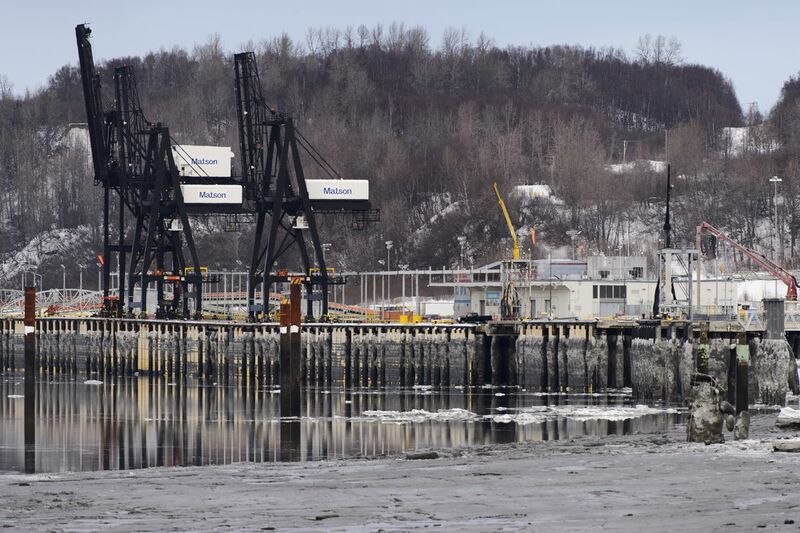 Anchorage port customers on March 15 affirmed the possibility that self-funding a rebuild of the critical but badly corroded infrastructure they use might drive ultimately business away from the port and Anchorage in general. Municipal and port officials are once again in the midst of an analysis to determine exactly is needed how to pay for it at what is arguably Alaska’s most critical piece of infrastructure. The ongoing Anchorage Port Modernization Program would mostly replace the existing docks with a few additions. While scaled back from the failed port expansion project of the late 2000s, the current work is expected to cost upwards of $1.9 billion to complete, according to the project management firm CH2M, which was recently purchased by Jacobs Engineering Group. That price has been met with varying levels of sticker shock; it also includes more than $500 million for risk contingencies and cost escalations as the current schedule calls for work through 2028. Increased foreign steel tariffs; building to high seismic criteria with a 75-year working life; the logistical complexities of keeping the port open during construction; and removing much of the 30 acres of fill that created a large area of backlands at the north end of the port during the expansion project further add to the cost. First in line for replacement is the petroleum and cement terminal, or PCT, which is scheduled to be replaced over the next two years at a cost of $223 million. The PCT is on the oldest section of the docks and must be done first to free up space for when the adjacent cargo docks are rebuilt, according to port officials. Some sections of the pile-supported docks have been in place since 1961 and have far exceeded their initial 35-year design life. Studies indicate the pile maintenance program can keep the docks open for about another nine years before pervasive corrosion from seawater will start forcing closures. The PCT work is being partially funded with unspent money from the first project and court settlements, but absent state or federal funding, city officials in February proposed drastic increases to the port’s fuel and cement import tariffs to cover the cost of borrowing up to $200 million through revenue bonds for the remainder of the work. Representatives from port user companies said at a March 15 Anchorage Assembly Enterprise and Utility Oversight Committee meeting — the second in a series of meetings examining port reconstruction — that increasing the port’s fuel tariff by more than 500 percent would likely increase the cost of fuel and goods across the state. It’s estimated that up to 90 percent of the goods destined for delivery across mainland Alaska arrive across the port’s docks. In 2017, the Anchorage Assembly renamed it the Port of Alaska in an attempt to highlight its importance statewide and hopefully drum up support for its rebuild. Few state leaders deny the necessity of the port work, but the prospect of meaningful levels of state assistance is bleak as lawmakers continue to wrestle with how to close large state budget deficits. Specifically, the proposed fuel tariff change would incrementally increase the current 0.38 cents per gallon to 2.4 cents per gallon in 2023, which would be sufficient to cover the debt service on bonds to pay for a new PCT when combined with cement tariff hikes. While just about 2 cents per gallon in nominal terms, the impacts of the higher petroleum tariffs could be much larger in practice, according to shippers and others. Bert Mattingly, a manager with Anchorage Fuel and Service Co., said any tariff increase would force the international cargo carriers that support a large portion of the business at Ted Stevens Anchorage International Airport to reexamine their operations. Anchorage Fuel and Service doesn’t buy fuel. Rather, it is a consortium of 18 primarily cargo airlines that own fuel facilities at the airport and handles the fuel purchased by the individual carriers. Roughly half of the 616 million gallons of jet fuel the company received in 2018 came through the port, according to Mattingly. Anchorage Fuel and Service also owns the pipeline that carries jet fuel from the port to the airport, he said. The Anchorage airport is the fifth busiest cargo hub in the world mainly because of its position between manufacturers in east Asia and consumers in North America, and that cargo business is a large reason the airport supports 10 percent of the jobs in the city, according to the Anchorage Economic Development Corp.
Refueling in Anchorage allows carriers to fill aircraft with more cargo instead of carrying the added fuel that would be needed to reach refueling hubs or destinations to the south and east. However, the economics of the cargo business model rely on a difference of pennies per gallon between hauling more fuel or hauling more cargo, industry experts note. As a result, any tariff change at the port could impact international business at the airport, Mattingly said, adding that newer, more fuel efficient jumbo jets have already begun to challenge the model of an Anchorage stopover. “We’re in a good place physically for heavy cargo to come through but on the return flight (cargo carriers) have a lot more options” for refueling locations, he said. Petro Star Vice President Mark John characterized the Alaska fuel business as an “incredibly competitive” market where changes as seemingly minor as “fractions of a penny” can influence decisions. Petro Star operates small refineries in North Pole and Valdez as well as fuel terminals across much of the state. The company also purchased a 200,000-barrel storage facility at the Anchorage port in 2017. John said in response to questions about other funding alternatives that Petro Star’s parent company, Arctic Slope Regional Corp., is aware of the situation at the port and is also active in state lobbying efforts for its businesses. Committee co-chair Assemblyman Christopher Constant commented that the tariff proposal is the first thing the city has done regarding the port project that has garnered attention from outside Anchorage. “As scary as it might sound that this could happen it might be the first time we can actually educate people outside of Anchorage that this is their port,” Constant said. The situation for cement could be similar to fuel if the tariffs are enacted, according to Ryan Zins of Alaska Basic Industries, which imports cement at the PCT. Cement tariffs would go from $1.61 per ton eventually to $8.30 per ton under the city’s proposal. Anchorage Municipal Manager Bill Falsey has said city officials believe the current market price for cement is about $155 per ton. “If we look at it from a tariff standpoint, what I hear is lost jobs,” Zins said. He acknowledged the market can absorb some cost increases on cement but the proposed tariffs would equate to $750,000 to $1 million either coming out of Alaska Basic Industries’ bottom line or its customers pockets. The company is in the fourth year of a recession in its business, Zins said, adding that the tariffs could curtail some work in an already fragile construction sector. However, the worries about the basic commodity tariffs don’t even consider what it would cost for Anchorage to self-fund the port’s general cargo docks used by TOTE Maritime and Matson Inc., which provide consumer goods to Alaska. City leaders estimate another roughly $200 million per year would need to be generated to cover the debt service for building new, permanent cargo terminals and the backlands removal and stabilization. All in, that work is pegged at nearly $1.5 billion. “I don’t know what (costs) we could pass on but it wouldn’t be $200 million a year,” Davis said. And while some shipments could possibly be routed to Seward or Whittier, he said that isn’t likely on a large scale. Whittier, tucked against the Chugach Mountains, doesn’t have much extra space; using the railroad isn’t feasible for time-sensitive produce, according to Davis; and adding large volumes of truck traffic to the Seward Highway from either alternative port is untenable. The most likely alternative is that more groceries would likely come north via the Alaska Highway, he said. Davis also clarified that TOTE and Matson need to use the port on the same days — Sundays and Tuesdays, necessitating two cargo docks — because supermarkets want fresh produce early in the week. Also, staggering the shipping schedules would put some ships back in Tacoma during weekends, when there is no freight to load, amongst other logistical challenges. After hearing the concerns of those most directly impacted by changes at the port, Falsey emphasized that city officials along with the Assembly are conducting a detailed review of every aspect of the modernization plan approved in late 2014. “We’re not interested in building a port that will cause business to flight from the airport. We’re not interested in building a port that will cause volumes to spiral down so that the port can no longer pay for the infrastructure that it just created,” Falsey said, while noting that something needs to be done soon. While Anchorage leaders have struggled for years to drum up support for state and federal funding or the port project, a new possibility emerged from one of the country’s largest labor unions at the March 15 Assembly meeting. Alaska AFL-CIO President Vince Beltrami said the building trades union has a large Building Investment Trust that it could utilize to leverage other funds and help with the Port of Alaska rebuild. The roughly $7 billion AFL-CIO Building Investment Trust supports the union’s pension plans and invests in projects its laborers can work on, according to spokesman Bob Struckman. As a concept, the trust would likely sell bonds to fund a large part of the project but would not become a part owner of the port, explained Struckman, who added the investment could be “in the range of hundreds of millions” of dollars or more. “We would enter into an agreement with Anchorage to service whatever investment that we put in. The terms are very good because we’re not Wall Street. I think we’re a lot better partner than a lot of sources of funding and it can be easier than self-financing,” he said. Beltrami said any such agreement would come with the expectation that AFL-CIO affiliated laborers would do the work and Constant noted the city would hire union contractors for a project the size of the port regardless of funding arrangements. Struckman said he’s very optimistic the union’s fund managers would be interested in the Anchorage port and he’s looking to get investors to Alaska soon to review the project.